This New Year, we're starting out with a bang. We're eating traditional foods but changing up of few of the recipes. Our greens have an Asian flare to them and our Blackeyed Peas and Chicken Wings are going to the Bayou. Try starting your year out with a Little Spice of Life "Variety". 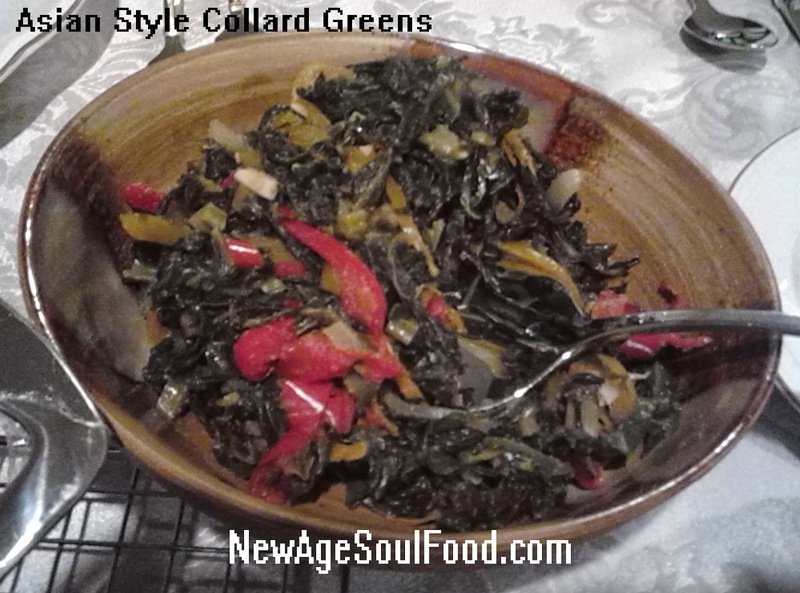 Happy New Years & Soulful Eating! Add 1 cup of the milk with the chocolate chips and sugar to a saucepan. Cook and stir over medium heat, until sugar and chocolate is dissolved and mixture comes to a near boil. 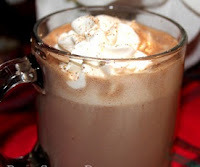 Stir in the remaining 3 cups of milk, the cinnamon, nutmeg and cayenne; bring to near boil again. Remove from heat. Pour into mugs, top with whipped cream or mini marshmallows, and grate a bit of fresh nutmeg on top. In a medium bowl, whisk together eggs, half and half, eggnog, vanilla, brown sugar, cinnamon, and salt until the sugar is dissolved. Place bread in a single layer in a 13 x 9 inch casserole dish. Pour the wet mixture over the bread, and let soak for 15 minutes, flipping halfway through. Heat a large pan over medium heat. Brush the pan lightly with melted butter. Cook each slice of bread for 2 to 3 minutes per side, until golden brown. Don’t overcrowd the pan or the French toast won’t brown evenly. 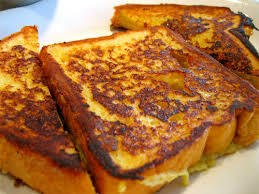 If cooking in batches, place cooked French toast on a wire-rack-lined sheet tray and keep warm in a 200-degree oven until ready to serve. Spread both sides of roll with the olive spread. Top one side with the eggplant, roasted peppers and top with the baby spinach. Drizzle on the red wine vinegar and olive oil. Close sandwich. Grill or place in a Panini press. Open the Italian bread on a work surface. Spoon the olive salad on both sides of the bread and spread evenly. Arrange the mozzarella slices on the bottom half of the bread, then top with the capocollo, Genoa salami and mortadella. 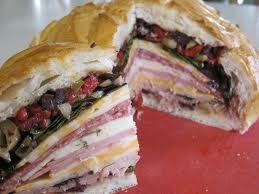 Arrange the provolone cheese on the top half of the bread, covering the olive salad completely. Carefully close the sandwich. Wrap the sandwich tightly in plastic and let stand for 30 minutes or up to 2 hours. 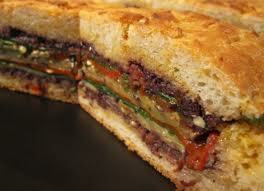 Cut the sandwich into 8 pieces and serve peperoncini on the side. 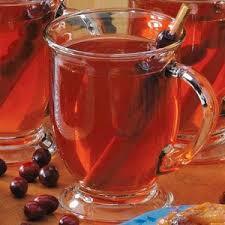 In a large pot, combine apple cider, cranberry juice, brown sugar, cinnamon sticks, cloves and lemon juice. Bring to a boil, reduce heat, and simmer for 15 to 20 minutes. With a slotted spoon, remove cinnamon and cloves. Serve hot. Mix together the dry seasonings and sprinkle over the drumettes on both sides (I like to let my wings sit overnight in the seasoning). Place wings on the baking sheets and bake for 30 minutes. Meanwhile, whisk together the melted butter, olive oil and hot sauce and set it aside. After 20 minutes of baking, increase the heat to 425 degrees F.
Remove the wings, from the oven and brush with the hot sauce mixture on both sides. Return them to the oven and bake at 425 degrees for 10 minutes. Continue to brush, turn and brush the wings for another 20 minutes or until done. 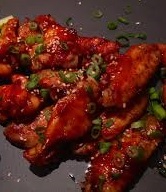 Place wings on a serving platter and sprinkle chopped jalapeno and sliced green onion over them. 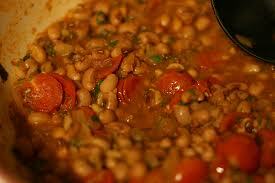 Place waters and beans in a large pot and place on medium low heat uncovered. Add the bay leaves, granulated garlic and onion and 1 teaspoon salt. Cook uncovered 1 hour, stirring occasionally. Meanwhile, in a large sauce pan, heat the olive oil and add the onions, peppers, garlic, sazon and 1/4 teaspoon salt. Saute 3 minutes. Add the tomatoes, 1/4 teaspoon of salt and saute until liquid is absorbed. Transfer the mixture to the bean pot and cook another 30 minutes or until beans are done and sauce is smooth and creamy. Keep beans covered with at least 1 inch of liquid at all times. If needed, add additional water, 1/2 cup at a time. Once beans are done, mix in chopped cilantro or parsley and serve over brown rice. 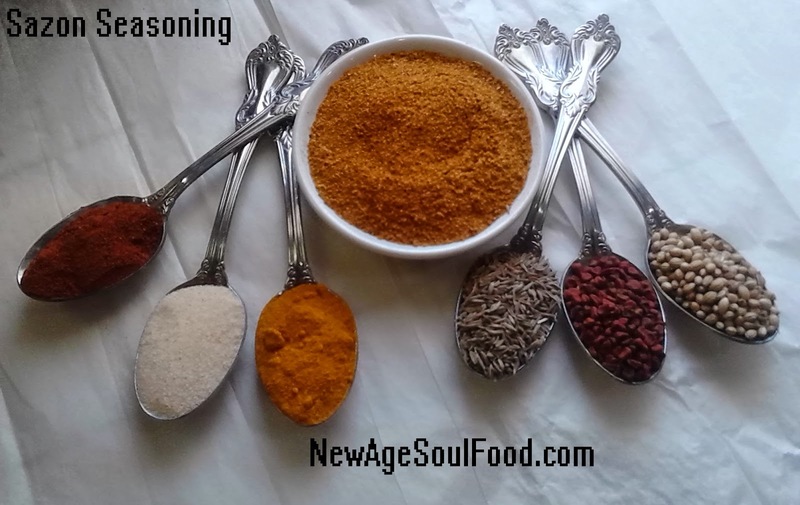 If you like that commercial brand then you're gonna love this 100% pure Sazon Seasoning! Heat oil in cast iron Dutch oven and sauté until slightly browned. Add the onion, green bell pepper and celery; sauté for about 5 minutes until soft. Add the garlic and cook another minute. Add the ham and sausage and cook another 3 minutes. Add the broth and blackeyed peas; bring to a boil. Stir in the rice, granulated garlic, granulated onion, Cajun seasoning, salt, pepper, bay leaf, jalapenos and green onion. Return to a boil, cover, reduce heat and simmer for 30 minutes. Remove from the heat and allow to sit covered for another 10 minutes before serving. Fluff with a fork. Heat a large sauce pan or wok add the oil and crushed red chili peppers and sauté until the chili flakes brown slightly. Add the onions, bell peppers, sliced garlic and minced ginger and saute until the onions are translucent, add the greens and mix thoroughly. Add tamari, orange juice, granulated garlic and ground ginger mix thoroughly reduce heat to low, cover and simmer 15 – 25 minutes or until greens are tender. Peel and cut potatoes into 1” cubes. Boil in water until fork tender about 13 minutes. Drain potatoes and while they are still hot, season with salt, pepper and paprika. Spread potatoes out on a sheet pan [cookie sheet] and let them cool to room temperature about 15 minutes. Then refrigerate uncovered in order for them to cool down for 30 minutes. 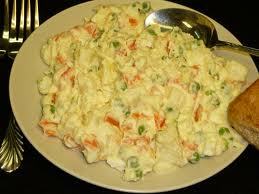 Place potatoes in a bowl and thoroughly mix in all the remaining ingredients. Cover bowl and refrigerate until salad is cold. Pour cream and milk into a sauce pan then whisk the sugar into the mixture. Separate the eggs, reserving the egg whites in the refrigerator for future use. In a small bowl, beat the egg yolks until lemon colored and thickened. Temper the eggs with a few spoons of the hot milk by adding the milk to the eggs a little at a time, and whisking constantly while adding them. Transfer the tempered egg mixture into the hot milk, whisking constantly until fully incorporated. Cook, stirring continuously for 3 minutes. Add in the vanilla, nutmeg and alcohol, refrigerate overnight. 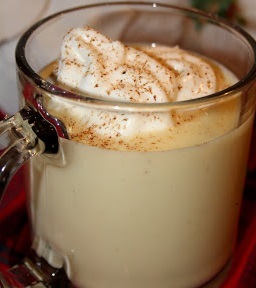 Pout into mugs and garnish individual mugs with whipped cream and freshly grated nutmeg, if desired.